Listening songs online using Online Streaming Services are more popular now. It’s because, you can listen your favourite music tracks anywhere without downloading it and also without spending any bucks. I’ve shared the Best Five Free Online Music Streaming Services before in one of my article. But You can’t get or view lyrics of the music songs while you listen online streaming music, You have to search it online. In Google Chrome, you can get and view lyrics on the same online streaming site using “Lyrics Here for Google Chrome” extension. This extension adds lyrics page in the music section of the current playing song. So you view lyrics of the song at the same time you can listen songs online. Currently this lyrics for Google Chrome extension supports YouTube, Grooveshark, Last.fm and Google Play Music. So whenever you play the music or video in those sites, Lyric will be added in that same page. It’s pretty cool to get lyrics for your favorite music without searching it. You can either choose to blend the lyrics flawlessly with the page, or show it in a beautifully designed tab or pop-up. Install this Lyrics Here for Google Chrome Extension from Google Web store. It will display the little music icon in the address bar, whenever you visit Spotify, Gaana, YouTube, last.fm in your google chrome browser. For example if you visit YouTube, the little music icon will be displayed in Google Chrome Address bar. 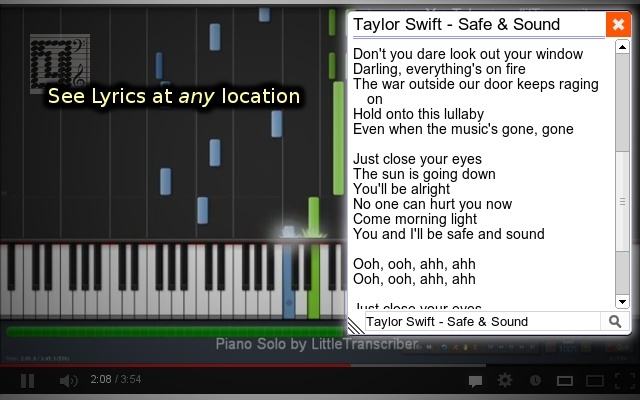 Choose and play your favorite song in YouTube and then click the little music icon in the address bar. That’ it, it will show the lyrics of the current playing song in the music page. You can also search lyrics in the omnibox, by typing “lyrics…”. Not only is it possible to search for a song title, you can also search for words you remember of the lyrics. Instant lyrics on YouTube, Spotify and other sites in a flexible panel.